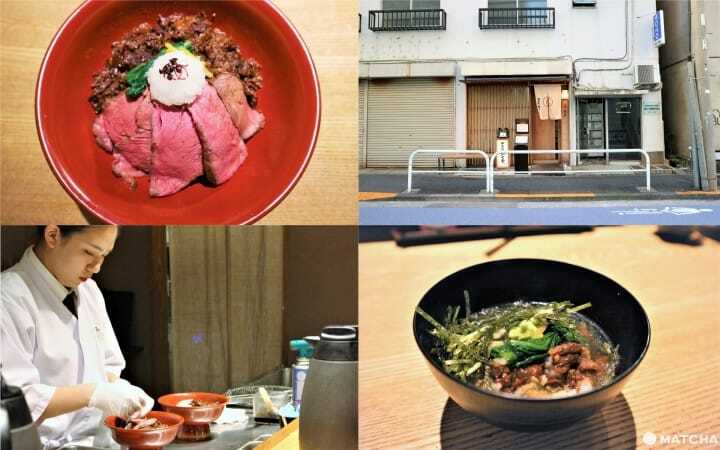 In the stylish neighborhood of Kagurazaka, you can savor Kuroge Wagyu (Japanese Black) beef dishes for only 1,000 yen! Head to Kuroge Wagyu Zeitakuju Senmonten for satisfying and affordable Japanese beef. Savor Japanese Beef in Kagurazaka! Kagurazaka is home to many hip restaurants and cafes, as well as other shops selling miscellaneous goods. There are also many temples and shrines, so this area is quite popular with all types of guests. You can also savor wagyu (Japanese Black beef) served in a bowl, donburi-style, starting from 1,000 yen (before tax), at the restaurant Kagurazaka Shozantei Kuroge Wagyu Zeitakuju Senmonten Kagurazaka Honten (Kuroge Wagyu Zeitakuju Senmonten). At this restaurant, they call this style of dish “oju” (jubako). It usually refers to a lacquered rectangular box. Huge lines of customers form at lunchtime every day, showing the popularity and diners' fondness of the restaurant. It is a must-visit place for those who want to enjoy a hearty meal of Japanese Black beef or to indulge in a delicious meal while sightseeing. Probably the first thing that comes to mind when talking about Japanese black beef is its not-so-affordable price. If you want to treat yourself to some Japanese black yakiniku (grilled meat), be prepared to spend 10,000 yen at least. However, the prices here are very reasonable at around 1,000 to 2,000 yen! Kuroge Wagyu Zeitakuju Senmonten buys A4/A5 and upper-class Japanese Black beef in bulk with other subsidiaries, allowing them to purchase ingredients cheaper than if they were to buy them individually. This is why customers can order delicious black beef for just 1,000 yen! There are three different Kuroge Wagyu Zeitakuju dishes made with Japanese black beef at this restaurant. There is ume (plum; 1,000 yen before tax), take (bamboo; 1,480 yen before tax), and matsu (pine; 1,980 yen before tax). The differences between the three are the types of Japanese black beef served on top of the rice. Ume consists of roast beef and shigureni (*1), take has sirloin steak added on top of that, and matsu also has tenderloin, as well. This article will introduce the jubako dishes you can savor at Kuroge Wagyu Zeitakuju Senmonten and how to eat it. *1 Shigureni: beef boiled with ginger, soy sauce, mirin, and sugar. In this article, we will introduce the ume dish. Now, let us begin! The first dishes served are cabbage and daikon raddish shisozuke (perilla-pickled dish; on the right), and nagaimo (Chinese yam) wasabizuke (wasabi-pickled dish; on the left). There is also an egg yolk (served as part of the sauce for the meat; on the right). The yolk should be eaten with the meat, so leave it for later. The cabbage and daikon perilla-pickled dish has a refreshing taste from the perilla, and cabbage and daikon add in a sweet punch to it. If you choose the nagaimo wasabi-pickled dish, you’ll probably breathe the wasabi out of your nose because of its strong flavor. You will also enjoy the crispiness of the nagaimo. The jubako of wagyu came while we were enjoying our pickled dishes! As soon as we opened the lids of the bowl, the mouth-watering aroma of shigureni and roast beef swept us off our feet. Even though you can eat it as it is served, we suggest trying three different ways that will help you fully savor the dish. The first method is to eat it the way it is served to you. This is in order to properly taste and enjoy the flavor of the meat. The gigantic portion contains five thick slices of roast beef and the hearty amount of shigureni covering the rice doesn’t at all seem like a dish you would get for just 1,000 yen. First, we ate two slices of roast beef and one-third of the shigureni. The roast beef is delicious with a nice thickness of the slices that makes them chewy and juicy. The shigureni beef is flavorful, tender, and melts in your mouth. Now you can use the egg yolk that came with the pickled dishes! Stir the yolk and pour a little over the meat. You can also dip the meat in it. The yolk makes the texture of the meat smoother. At this point, feel free to eat all of the roast beef from your jubako. However, leave some of the shigureni and rice. For the end, finish your meal in hitsumabushi (*2) style. Use the bowls and dashi broth left at the counter. Put the rice and the shigureni into the bowl. After that, pour the dashi on top of it. Sprinkling it with the yuzu (*3) skin served in the jubako will give the dish a refreshing flavor. *2 Hitsumabushi: a cut up, kabayaki-style eel topped rice dish. There are three steps to eat it – the first bowl is eaten the way it was served; the second with nori, wasabi, or scallions topping it; and the third, with dashi soup poured all over it, like ochazuke (rice with tea poured on it). *3 Yuzu: a type of citrus fruit. You can also top it with a little bit of wasabi, sesame seed, or nori (seaweed). Try out these three ways of enjoying the Japanese beef bowl to find your favorite! A Menu in Multiple Languages! The three tips for savoring the dish we talked about earlier are all written on the back of the menu at the restaurant. The menu and the instructions are provided in English and Chinese. If you wish to see the multiple language menu, please ask a restaurant employee. You’ll find only counter seats at this restaurant. The inside is very calming. It is not too bright, and the wooden interior makes the ambiance even more peaceful. Warm tea served before the meal really helps you calm down and enjoy the atmosphere. The distance between the customers and the staff allows you to relax, too. Also, You don’t have to worry if you’re alone by yourself. There are other solo diners present, too. You can even observe the roasting process and the food preparation at close distance while waiting for your dish! It is a great way to spend the waiting time, watching from the counter seat. After a Satisfying Meal, Go Kagurazaka Sightseeing! If you’ve had your share of beef at Wagyu Zeitakuju Senmonten Kagurazakaten, how about walking down Kagurazaka-tori, the main avenue in Kagurazaka? You can find Japanese trinkets at Noren Kagurazakaten, visit Zenkokuji Temple and admire its crimson gate, and have many more enjoyable experiences. You can also take a break at a charming café after a walk. We assure you the tranquil atmosphere will make you lose track of the time. Don’t miss the chance to enjoy both delicious Japanese beef and this elegant townscape!